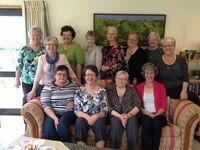 Cenacle Companions are women and men committed to sharing the vision, mission and spirituality of the cenacle. They form groups in order to participate in the charism and mission of the Congregation, according to their vocation as lay people, in the context of their daily lives. A process of formation leads them to respond to their call. All this unfolds in a way which is appropriate to the Cenacle story in the different countries and cultures of the Congregation. In this Region, groups of Cenacle Companions are found in New Zealand, Auckland and Wellington; and Australia, Perth.